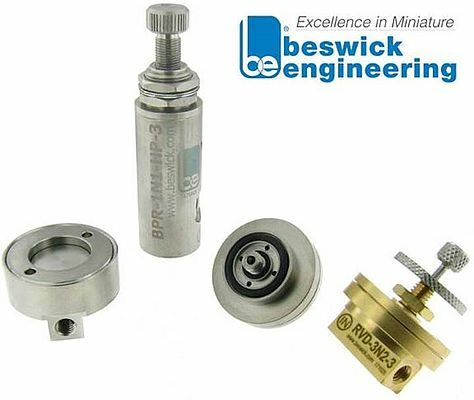 Beswick relief valves will mitigate the excess pressure situation in many different situations where installation space is restricted. The different series are design to meet specific requirements. RV2 series: Factory set relief pressures in the 3 to 30 psi range; 10-32 UNF threaded ports; Available in brass, 303 SS and 316 SS; Weighs 41 grams in brass and stainless steel; Piston style pressure sensing element. RVD series: User adjustable relief pressures in the 3 to 30 psi range (talk to us if you need a higher setting); 10-32 UNF threaded ports; Available in brass, aluminum, 303 SS and 316 SS; Weighs 25 grams in brass and stainless steel, 15 grams in aluminum (standard model); Diaphragm style pressure sensing element. RVD8 series: Manifold mount version of RVD; Available in brass and 303 Stainless Steel; Weighs 25 grams in brass and stainless steel (standard model); Diaphragm style pressure sensing element. BPR series: We call it a back pressure regulator but it can also be used as a relief valve. User adjustable relief pressures in the 3 to 400 psi range; Available in brass, 303 SS, and aluminum (depending on the model selected); 10-32 UNF inlet and either 10-32 UNF or 1/8 NPT outlet; Weighs 72 grams in brass and stainless steel and 33 grams in aluminum; Piston style pressure sensing element. If you want to learn more about the history of Pressure Relief Valves, download the pdf file with the download link on top of this article.